The U.S. Alcoholic beverage industry is very complex and highly regulated, and the laws currently in place find their roots in the time of prohibition and its repeal. Prohibition (18th Amendment to the US Constitution) was repealed through ratification of the 21st Amendment to the US Constitution in 1933 and the FAA (Federal Alcohol Administration) Act in 1935. Before Prohibition, producers of spirits and beer served small geographic areas and frequently owned the retail outlets. The government was concerned with these “tied house” practices; by virtue of having a partial or total ownership of retailers, suppliers coerced retailers to favor their brands. Consequently, the three tier system framework was adopted, including banning unfair inducements to retailers. The Federal government was granted authority to license importers, manufacturers, wholesalers, and warehouses (not retailers). The FET (Federal excise tax) was established and Consumer deception laws (false advertising banned) and standards/ requirements for labels and formula approval were developed. Federal regulations are administered by TTB (Alcohol and Tobacco Tax and Trade Bureau) and the FDA (Food and Drug Administration). Within the designed framework the States were given power to regulate sale and distribution of alcohol within their state. Each state adopted different rules and regulations that de facto resulted in 50 different regulatory frameworks for alcoholic beverage companies. Most states have liquor control boards that regulate the alcoholic beverage industry in their state. They require out of state entities (shipper) to maintain certain state-specific licenses and/or permits in order to sell products in the state. In some states, regulations can extend down to the municipality-level. Given that spirits, wine and beer are not regulated equally and have very different rules and regulations, it is fair to say that the US has over 200 different regulatory frameworks for alcoholic beverage companies to comply with. Under the three-tier system, manufacturers (Tier 1) sell to licensed importers, distributors and control boards. Brand owners could be manufacturers or entities that contracted with a manufacturer. Federal Excise Taxes are collected when goods leave the premises of the manufacturer or the bonded facilities of an importer. 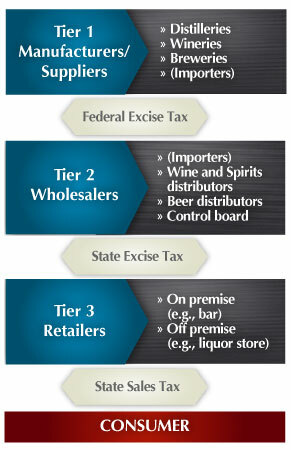 Licensed importers and distributors (Tier 2) act in cooperation with the federal and state governments; they help ensure that alcohol beverage taxes are reliably collected. Importers, distributors and control boards are only allowed to sell to licensed retailers. Licensed outlets like liquor stores, bars or restaurants (Tier 3) ensure that alcohol is sold to those who are of legal age to purchase it. Acting like a safety net, the three-tier regulatory system provides for “checks and balances” in the way that alcohol is distributed and sold throughout the system, from one licensed tier to another. 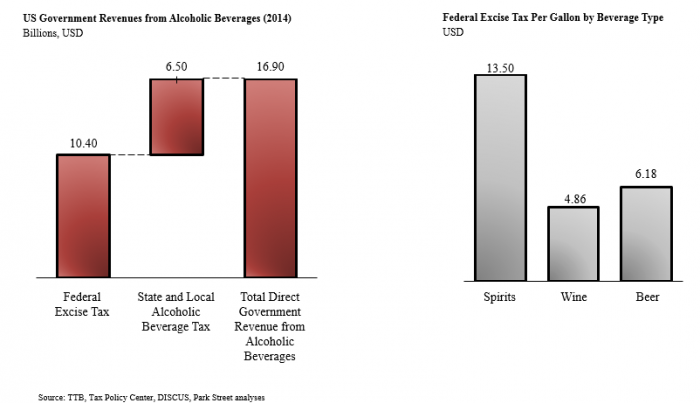 If alcohol is sold outside of the three-tier system, the government loses revenue from alcohol beverage taxes. No individual or entity except the state regulator itself is allowed to own and operate more than one tier of the system (tied house rules). Below is a diagram of the tier system. Here at Park Street, in addition to providing clients with services, we do our best to share the most accurate and up-to-date information related to the alcoholic beverage industry. If you’re interested in learning more about us or if you’d like to connect with us here at Park Street, then we encourage you to call or send us a message. We love connecting with new people! Looking For An Industry Leading Solutions Provider? With over 45 years of industry experience, find out why hundreds of brand owners choose Park Street over others. Contact us today for more information on what we can do for you.